A camera with a sensor that is curved like the retina of your eye has been created by researchers from the University of Illinois at Urbana-Champaign. 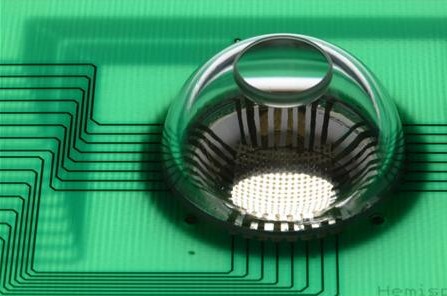 It uses a flexible mesh of silicon light-detectors. The team's solution was to use a series of silicon photodetectors (pixels) connected by thin metal wires. This network is supported and encapsulated by a thin film of polyimide plastic, allowing the flexible scaffold to bend when compressed. This scaffold takes up the mechanical stress and protects the pixels as the array takes its hemispherical shape. “The ability to wrap high quality silicon devices onto complex surfaces and biological tissues adds very interesting and powerful capabilities to electronic and optoelectronic device design,” says John Rogers, a materials scientist. "It allows us to put electronics in places where we couldn't before." At present, the camera is limited to just 256 pixels; however, this can easily be scaled up, according to Rogers. SF readers of course remember the eye-shaped camera that replaces Col. Austin's eye in The Six Million Dollar Man TV series. I suppose the idea of an artificial eye is as old as humanity, but 'Doc' Smith has a very early (1937) sfnal reference to the artificial eye. The device can enable the patient to discriminate between rudimentary patters of motion, light and dark. 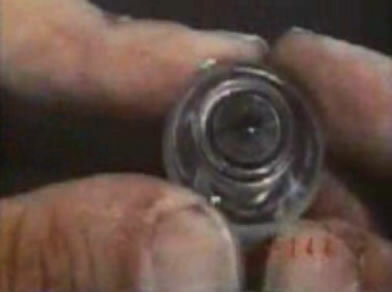 The new 'bionic eye' device uses a special prosthetic that sits on the surface of the eye. From Nature; see also the Six Million Dollar Man intro video w/bionic eye.